Short-listed for the Glenfiddich and Guild of Food Writers Awards. Foreword by Josceline Dimbleby. Classic Turkish cooking ranks among the greatest cuisines of the world. It has a long and colourful history from its nomadic Central Asian roots to the refined recipes of the Ottoman empire which influenced culinary traditions throughout the Middle East and Mediterranean. 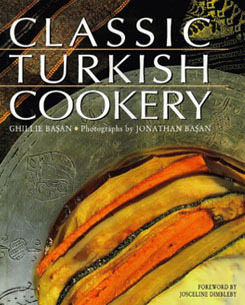 In this classic and much-loved work – shortlisted for the Glenfiddich Cookery Award and now published in paperback for the first time – Ghillie Basan presents a unique collection of delicious traditional dishes from the Anatolian heartlands and sophisticated and classical recipes from the palace kitchens of the Ottoman sultans.